Welcome! For web skills training, web development or Ontraport consulting, click here. Deepak Chopra, M.D. shared new insights from his latest book, The Healing Self, at a presentation in Los Angeles last week. As a longtime believer in the power we each have to optimize our health and wellbeing through lifestyle and nutrition, I’m so grateful I had the opportunity to attend. In The Healing Self, Deepak and co-author Rudolph Tanzi, PhD present groundbreaking research on the supreme importance of self-care, placing the responsibility on each of us as individuals to make healthy lifestyle choices to ensure lifelong health. Among the insights shared, three research findings in particular stood out. First, Deepak shared that 90% of chronic illnesses in our society are preventable. Only 5% of disease-related gene mutations cannot be stopped unless a future drug or technology is developed to stop that expression. I had previously read that a number of chronic illnesses, including many cancers, heart disease, diabetes, and one in three cases of Alzheimers, are preventable. However, I had no idea that as many as 90% of chronic illnesses can be prevented. Very exciting. What’s more incredible to learn is that the seed for many chronic illnesses is planted decades before the illness actually manifests. Take dementia, for example. The reason why education is so important to lifelong brain health is because brain connections and pathways between neurons are created when we learn new things and add information to our brain stores. If a person experiences memory loss associated with Alzheimers, the logic suggests that the brain has extra pathways to follow if some grow weak or diseased. This is incredible – and provides even deeper motivation to always be learning, not just to keep our skills relevant and to stay updated as life around us continues to change, but more importantly to optimize brain health. In addition, the idea that lifestyle choices now can influence physical wellbeing in decades to come is equally important to keep in mind. 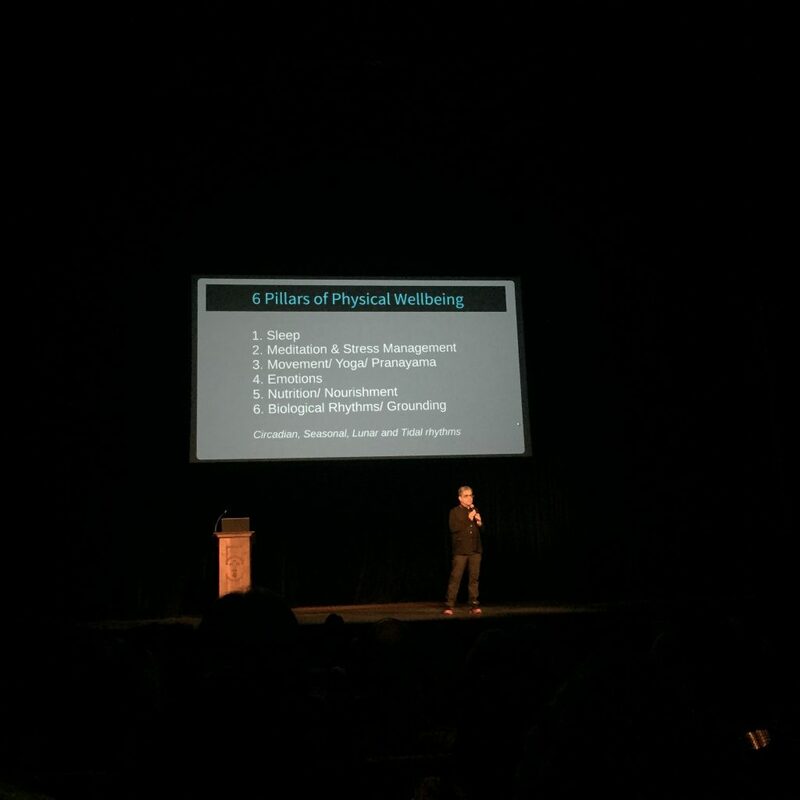 During his presentation, Deepak elaborated on the 6 most important ways we can optimize wellbeing and prevent a chronic condition from developing later in life. While most of the lifestyle choices mentioned in this list (especially sleep) were not a big surprise, two things in particular stood out. 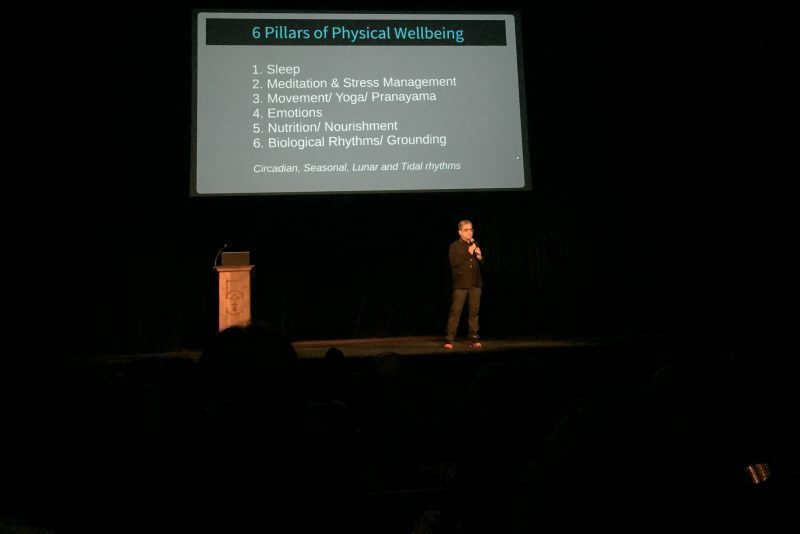 The first is that emotions are among the 6 pillars of physical wellbeing. Now, it’s no surprise that emotions influence physical wellbeing. Grief, anxiety and depression, in particular, can significantly impact energy level, appetite and reduce the immune system. On the flip side, love is known to boost immunity and reduce stress. When it comes to physical wellbeing, nutrition and exercise often overshadow emotions. It was refreshing, therefore, to see emotions mentioned. It’s clear that embracing emotions and finding ways to release emotions that don’t serve us are important. Which brings me to the second thing that stood out in this lineup: grounding (aka earthing). Grounding is essentially putting your body in direct contact with the earth. Whether you’re walking on the beach or in the grass or dirt, the idea is that all of nature is charged with energy. When you touch the soil, sand or earth, the negatively charged ions from the earth transfer to the body which neutralize the positively charged destructive free radicals that are involved in chronic inflammation. Like emotions, when it comes to ways to promote physical wellbeing, grounding is a lifestyle practice that often doesn’t receive as much attention. Yet, most of us can appreciate how amazing it is to be in nature or spend time at the beach or nurture a garden. The main takeaway of The Healing Self is this: wellness is in your hands. Self-care, including lifestyle and diet choices, is the key. I’m excited to learn more as I dive into the book, The Healing Self. Have you read this book? What insights stood out to you? What self-care practices are you incorporating into your day to optimize your longterm wellbeing? Let’s connect. I’d love to hear from you. Thank you Deepak for coming to Los Angeles and for sharing your and Rudy’s important work. Katrina Heppler helps holistic health entrepreneurs thrive through 1:1 business mentorship and her signature business accelerator, The Kollective. She is a certified Ontraport consultant with deep expertise in strategic online marketing, business systems and web development. She is a certified yoga teacher via YogaWorks and a student of Ayurveda at California College of Ayurveda. Let’s stay connected: sign-up for Ayurveda & yoga insights and upcoming workshops. Disclaimer: All information presented on this website is for informational purposes only. These statements have not been evaluated by the Food and Drug Administration. This website is not intended to diagnose, treat, cure or prevent any disease and is not intended to be a substitute or replacement for any medical treatment. Please seek the advice of a healthcare professional for your specific health concerns. Individual results may vary. ∞ One more thing, yo! At katrinah.com, I sometimes use affiliate links to promote awesome products I love and think you'll love too. I may earn some income from these links.